Last night Mrs. Everett, the kids and I all went up to a park in the hills behind Beverly Hills called Franklin Canyon Park. Our goal was to seek out inflame and devour marshmallows. Rose doesn’t eat sugar and the boy just doesn’t like marshmallows so it worked out very well for yours truly. As you shall soon read. 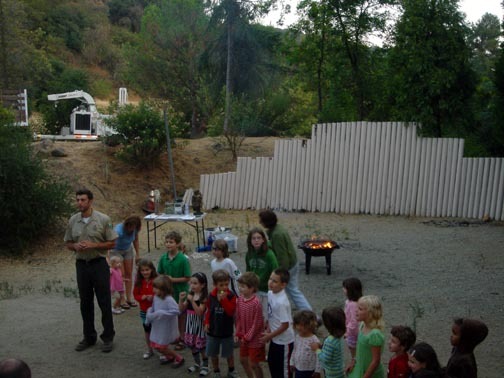 Every Wednesday Franklin Canyon Park, Hermosa Vista Park and Temescal Canyon Overlook Park host free campfires with marshmallows and stories all Summer. We arrived to see Nature Ed had started the demonstration promptly on time at 7:00 PM. Today’s presentation was on Owls. You can see from the pictures he brought some examples which as he says were once real. As if on cue, a hawk perched itself nearby to listen as soon as he mentioned raptures. The pic on the bottome left was my best shot because the tree was so tall. The kids knew more about the local owls than I did. 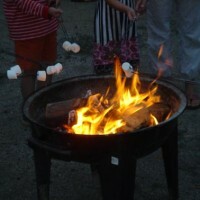 More people started to arrive and soon everyone joined in a on a couple campfire songs but not for long as it is hard to keep kids distracted when marshmallows are about and there is the promise of roasting them. 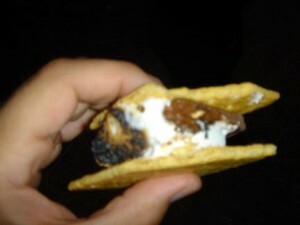 It was now time for the pièce de résistance, s’mores. I’ll let you in on a not-so-well-kept secret. Mrs. Everett LOOOOOOOVES chocolate. Her stupid husband mistakenly told her there would be s’mores. When she saw that the rangers only brought marshmallows and skewers she started to fret and the immediate future harmony of the Everett Household was in jeopardy. Fortunately mothers are a wise lot and a group of mothers is even wiser. Soon Mrs. Everett’s eagle eyes (large like the owls we just learned about) spotted the dark brown substance of her desire and sidled right up and pulled out her motherhood membership card. She was graciously given enough graham crackers and chocolate for a total of two s’mores. This too worked out for Mr. Everett for two reasons. One harmony was restored and two, 2 kids who don’t eat but like to roast marshmallows plus enough fixins for two s’mores equals one for papa. Sorry for the fuzzy shot of my s’more but I had to eat it fast or Mrs. Everett might have taken it and my hand if I didn’t finish it before she was done with hers. Knowing Mrs. Everett as I do, she will bring lots of chocolate and graham crackers for everyone next time. Bring a sweater, it does get cool and since it does get darker kids love flashlights to avoid any tripping on trails or steps. We always like to bring glow sticks for the kids at any outdoor night activity like camping. They love them, it makes them feel safer for some reason and it is much easier to keep an eye on them. We buy them in bulk at the surplus store and get different colors so we know who is who. Always bring extras for friends they have or may meet. It was very dark by the time we left and we drove through the park to the south entrance which is itself a cool thing to do. As you get to the gate it looks like you are locked in but you simply drive up to it and it will open outward automatically. During the day you can see a few small ponds, lakes, reservoirs or whatever you want to call them. 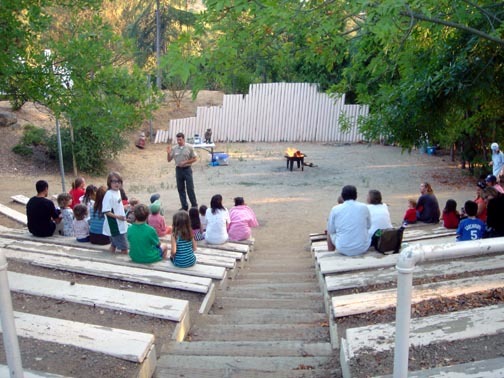 It is not one of our more well known parks but it is one of our most famous because they shot the beginning to the Andy Griffith Show here. This is where Andy and Opie walk along with fishing poles. Next time I go back and have some day light, I’ll grab a few shots of the lake. 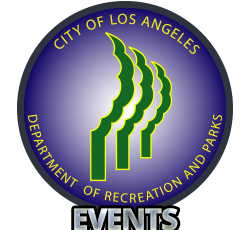 Campfires are also free to build out at the beach just south of Marina Del Rey. There are several fire pits. I would have included them in my 30 week challenge but firewood isn’t free although I’m sure many there would let you enjoy theirs. I hope you enjoyed this installment of the 30 week challenge which is so ahead of schedule I may have to expand it.